This blog post continues a series exploring volatility-linked exchange-traded products. In this post, I examine the Bank of America Strategic Return Notes Linked to the Investable Volatility Index (“SRNs”), which were issued on November 23, 2010 and matured on November 27, 2015. The SRNs were supposed to offer investors exposure to a volatility index over a five-year period. However, due to high upfront and ongoing annual fees and the negative roll yield (previously discussed here and here), the investment resulted in almost a complete loss. What is remarkable is that anyone who understood volatility products and negative roll yield would have known this ex-ante, that is, before the product was brought to market. This is an example of how complexity risk manifests itself in investments, the people who created the investment didn’t understand it. The SRN Pricing Supplement lists the two percent upfront fee and the 0.75% annual internal fee as costs but does not mention the negative roll yield as a cost. This is remarkable given that the negative roll yield is the primary cost of the strategy as it was to be implemented. If the level of forward implied volatility is higher in the more distant S&P 500 Index options expirations months than it is in the nearer expiration months, then the level of the Index could be adversely affected as the Index positions are rebalanced daily to maintain a constant maturity. The rebalancing involves increasing exposure to more distant forward implied volatility and decreasing exposure to more near-term forward implied volatility which may decrease the payment you receive at maturity or upon exchange. Historically, the more distant expiration months have typically had a higher level of forward implied volatility than the nearer expiration months. This explanation does not make it clear that the negative roll yield will be an almost certain daily destroyer of the investor’s principal. Given the five-year term of the investment, the negative roll yield, coupled with the two percent up-front fee, and the 0.75% annual internal fee are virtually guaranteed to result in a catastrophic loss to the investor. Of course, that is what happened. The SRN’s were issued at $10/share and matured at $0.50/share. A 95 percent loss. The negative roll yield was costing between four and 12 percent per quarter in 2011. The roll costs are far larger than we ever understood or were disclosed to us… This is borderline crooked. To Mr. Ringwall’s point, if we assume that the negative roll yield was four percent per quarter that equals 16 percent per year. Apply that over the five-year term of the SRNs and you get an 80 percent decline in principal. Add the 5.6 percent total term costs from the front-end load and the ongoing management fees and the SRN is programmed to decline by 85.6 percent over its lifetime (assuming no movement in the underlying index). Put another way, the underlying index would need to have and 85.6 percent return just to break even. It is hard to believe that anyone associated with the SRNs creation understood these economics. It appears that the brokers who sold it certainly did not understand. And I can assure you that not one client who was sold the SRNs understood them. 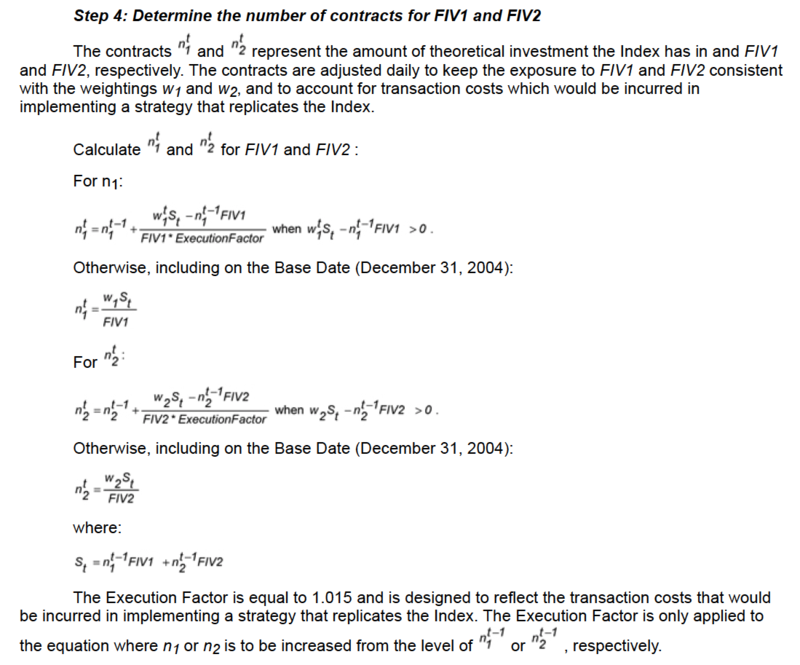 Obviously, no client is working through these equations. The written and formula disclosures above illustrate the primary point of investment complexity risk: the more complex an investment is, the more likely it is to behave in ways that are unexpected. This is the reason why complexity should generally be avoided and even sophisticated institutional investors should have a complexity risk budget to track and limit their exposures. As I have discussed in my previous posts, there are other volatility products such as the iPath VXX ETN trading today that have the same internal negative roll yield dynamics. Supervisors must be knowledgeable about these investments and how they are not meant to be held longer than one day. Supervisory policies and procedures should be implemented to insure that any holding periods longer than one day are flagged in exception reports and remedied immediately. Strategic Return Notes Pricing Supplement; PS-14. Jean Eaglesham, The Wall Street Journal; SEC Readies Case Against Merrill Lynch Over Notes That Lost 95%; Available at: https://www.wsj.com/articles/sec-readies-case-against-merrill-over-notes-that-lost-95-1466544740; Accessed December 1, 2017. Strategic Return Notes Pricing Supplement; Annex A; A1-2. I have only produced part of them here.